In Westfield W-League Week 10 action, Brisbane extends their lead at the top of the W-League from 2 to 4 points while City’s 3-0 win over Perth puts the Glory under pressure to make the semifinals with three games left in the regular season. 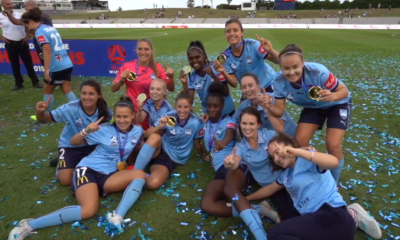 On Wednesday January 3, in a midweek game which saw 4,229 come to Sydney’s Allianz Stadium for a W-League/A-League doubleheader, Sydney FC saw its five-match win streak run come to an end. Early goals from former Australian international and Sydney FC original (playing in the league’s inaugural season of 2008/09) midfielder Kylie Ledbrook (her fifth of the season) and young phenom and Australian international Princess Ibini (her second of the year) gave Sydney a two-goal lead within the first half hour. Ibini, still only 17 years old but in her third season with the Sky Blues, has doubled her yearly output of goals, having scored once each previous season. She has been capped at the senior level this season and has a very bright future in the game. Australian international Emily Van Egmond (who has played in NWSL, Germany and Denmark) scored for the Jets in the 35th minute (her second of the year) while Gema Simon (who played this season in Norway after time in Japan and a short stint with Ottawa Fury in the now defunct USL W-League) picked a perfect time for her first goal of the season, netting the tying goal for Newcastle in the 89th minute. American international Emily Sonnett (Portland Thorns) and goalkeeper Audrey Bledsoe (Orlando Pride) played the entire match for Sydney. For the Jet’s NWSL loanee contingent, goalkeeper Britt Eckerstrom (Portland Thorns), defender Arin Gilliland (Chicago Red Stars), midfielder Tori Huster (Washington Spirit) and Katie Stengel (Boston Breakers) played the entire match. With the tie, the two clubs remain firmly in the race for second place and the right to host a semifinal, with Newcastle on 17 points, one point ahead of Sydney on 16 points. Both clubs having three games left in the regular season. On Friday January 5, Brisbane Roar came from a 1-0 deficit to defeat Melbourne Victory 2-1 to maintain their top of the table pace and record their third win in a row. Melina Ayers—in her first season with the Victory after two seasons with Melbourne City—gave Melbourne the lead with a stunning strike from outside of the box in the 22nd minute; a goal that should be a strong candidate for goal of the year. Roar scored their goals in the second half from Roar Captain Claire Polkinghorne (ex-Portland Thorns), which was her second of the season, and Thorns American import Celeste Boureille, who scored her first goal in the W-League after two seasons with the club from a nifty header in the box in the 80th minute past the Victory’s Australian international goalkeeper Casey Dumont. For Brisbane, NWSL imports Haley Raso (Portland Thorns), Carson Pickett (Seattle Reign) and Boureille (Portland Thorns) all played 90 minutes, as did ex-NWSL players Katrina Gorry and Polkinghorne. For Melbourne, Kristen McNabb (Seattle Reign), Natasha Dowie (Boston Breakers) and Australian international Laura Alleway (ex-Orlando Pride) all played 90 minutes, while Christina Gibbons (Sky Blue FC for 2018) subbed out in the 59th minute for forward Tiffany Eliadis. 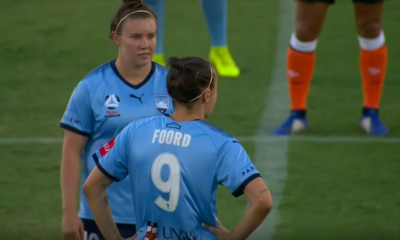 Canberra United used a hat-trick from Norwegian international forward Elise Thorsnes to power a 6-1 thrashing of Adelaide United on January 7 at home in front of 1,050 fans. 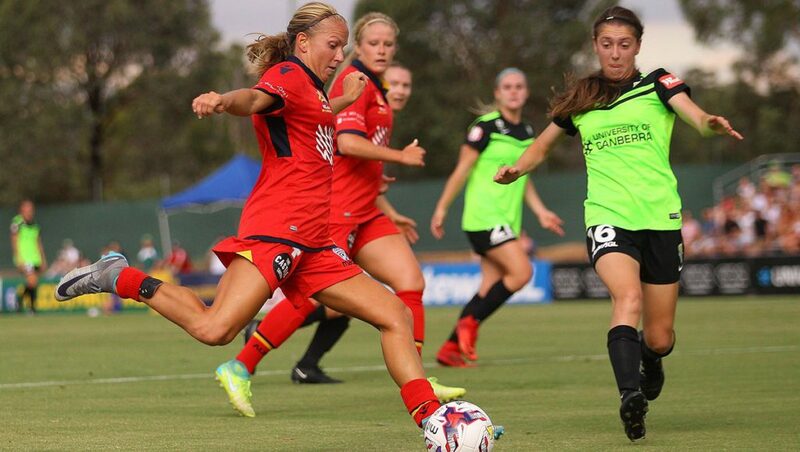 Also for Canberra, Karly Roestbakken and Australian youth and senior international Ellie Carpenter (17) each scored their first goals of the season while Ashleigh Sykes (Portland Thorns) scored her second. Alyssa Mautz (Chicago Red Stars) scored the lone reply for the Reds. Canberra is still in sixth place with 12 points and four points out of the playoffs but has a game in hand on all of the top five teams, so they still could sneak into the finals. 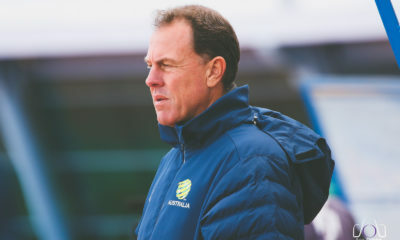 For Canberra, goalkeeper Haley Kopmeyer (Seattle Reign) and Pressley played 90 minutes while Sykes subbed out in the 53rd minute with the score 5-1, replaced by Australian youth international Grace Maher. 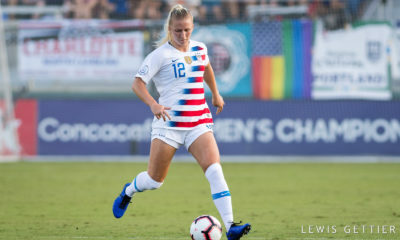 For Adelaide, NWSL loanees Danielle Colaprico, Katie Naughton (all Chicago Red Stars) and Makenzy Doniak (North Carolina Courage) played the full 90 minutes, while Mautz subbed out in the 61st minute for 18-year-old Australian Nora Peat, who is in her first year in the league. Melbourne City defeated Perth Glory 3-0 on January 7 in a match that had huge playoff implications for last season’s Grand Finalists. Melbourne used first half goals from Ashley Hatch (Orlando Pride)—her second of the season—along with goals from defenders Tyla Jay Vlajnic and Japanese international Yukari Kinga—both their first of the year—to lead City to the win in front of a home crowd of 508. Vlajnic has been with City for three seasons now and scored her first W-League goal while Kinga had three last season for Canberra. City now is in a tie for third place with Sydney FC on 16 points, while Perth remains on 13 points and is now in fifth; the Glory needs to string at least a couple of wins together in their last three games in order to make the playoffs. Perth has only 1 point from their three previous matches. For City’s NWSL loanees, Lauren Barnes, Rebekah Stott, Lydia Williams and Jess Fishlock (all Seattle Reign) and Steph Catley and Alanna Kennedy (both Orlando Pride) all played the entire match while Hatch subbed out in the 72nd minute for Australian Rhali Dobson for the second consecutive match. Kyah Simon, who formerly played for the Boston Breakers in the NWSL, also played the entire match, while Larrisa Crummer (Seattle Reign) did not play. For Perth, Amanda Frisbie (Boston Breakers), Sam Kerr (Sky Blue FC), Nikki Stanton (Sky Blue FC), Costa Rican international Raquel Rodriguez (Sky Blue FC) and Rachel Hill (Orlando Pride) all played ninety minutes. Brisbane Roar tops the W-League table with 21 points, with Newcastle Jets second on 17 points, one ahead of Sydney FC and Melbourne City (16 points) in third. Perth is now in fifth on 13 points, one ahead of Canberra (12 points). Melbourne Victory and Western Sydney are five points further behind in seventh with 7 points and Adelaide is last with 4 points. Tim Grainey is a contributor to Equalizer Soccer. His latest book Beyond Bend it Like Beckham. Get your copy today. Lauletta: Is it still 2018 in Orlando?